Mechanical, Civil, CSE, IT, Chemical, Automobiles, Electrical and Electronics, Metallurgy. 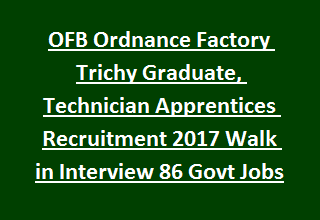 Available vacancies at OFB Tiruchirapally is 86 for this Apprenticeship. Interested candidates may attend the walk in interview on 13-11-2017. Candidates who are passed Engineering or Diploma after Dec-2014 they are only eligible for this OFM Graduate/Technician Apprentices Recruitment 2017. Selection for these vacancies will be based on their marks in educational qualifications and personal interview. There are total 86 Apprentices jobs in OFM Recruitment. Age limits are applicable as per the Apprentices Act 1961. Selection for this Graduate/Diploma Apprentices jobs will be based on merit in educational qualifications and performance in interview. Candidates who are qualified Engineering or Diploma after Dec 2014 they can attend the walk interview on 13-11-2017. At the time of attending the interview candidate must have bring the original documents and 2 sets photo copies of the original certificates. Address HRD Section, Ordnance Factory Tiruchirappali,Tamil Nadu State.